Pictured Above: Pat Behan demonstrates CPR. “Nobody has ever died from a heart attack. You cannot die from a heart attack!” The St John’s Ambulance instructor knew he was provoking alertness through a play on words. Surely there had to be some obvious clarification of semantics to follow? When NewsFour attended a St John’s Ambulance first-aid course instructed by Pat Behan, pictured below and right at a CPR demonstration, it came to light that he was a complete volunteer. Although St John’s members are known as volunteer first-aid cover at events and matches, it was interesting to note that the instructors were giving volunteer teachings to the public to ensure cost effective first-aid courses. NewsFour was intrigued about a volunteer’s motivation and our curiosity unveiled a very interesting and humble character. 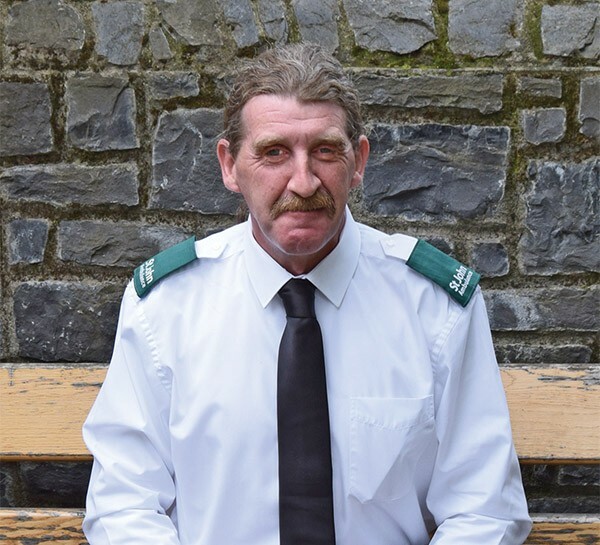 Not only was Behan giving up his time and expertise to spread the skills and knowledge of life-saving techniques and practices that could be needed at a minute’s notice, he also proved to be a man with a very interesting path in life. Behan, pictured below, recalled how his dream was to learn to fly when he was younger but he was “not good at heights!” Nevertheless, he found himself performing search and rescue flying missions over Alaska for several years before travelling again and returning to Ireland. Those initial intentions of flying not only had the obstacle of being unsure of heights, but he has also suffered accidents that were thought to have put paid to his ambition to pilot. This includes a tractor literally driving over him at 15 years of age, cracking his skull and resulting in an eye loss. Pictured Above: St John’s first aid instructor Pat Behan. The seminal moment in his life in relation to what he does now, however, was a motorbike accident. Having come off his bike and hitting a pole, he awoke moments later lying on the ground to see cars driving up on the grass verge to avoid stopping and checking on him. This experience left its mark on him to the degree that he would ensure he would never be that person. He had inadvertently started his path to be the Good Samaritan. Behan has worked in numerous countries around the world, performing roles such as a forensic photographer in his past. Yet his passion emerged and he has settled in doing the work he now does, both as a professional daytime job in Heartbeat Safety as well as his endless hours in St John’s in the evening and weekends. The headquarters of St John’s ambulance are right here in Dublin 4 on Leeson Street. They offer on-going courses for the public. These include Occupational First-Aid, which teaches a person to respond appropriately to any accidents and use effective resuscitation techniques, including a defibrillator. There is also the important Cardiac First Response in the Community course. In other words, if you’re experiencing pain, you’re breathing. Get to a hospital to get checked. However, 80% of heart events are ventricular fibrillation (VF) problems, which is like the heart being in spasm. This is where CPR comes in to keep the blood pumping to the brain. If a person can just do CPR on a victim of VF they could save a life. This is why Behan wants to spread the message on that simple idea of resuscitation and why he has become involved in another initiative called Beating Again. The idea is to set up in different locations and just grab the public to teach them simple CPR within a matter of minutes. 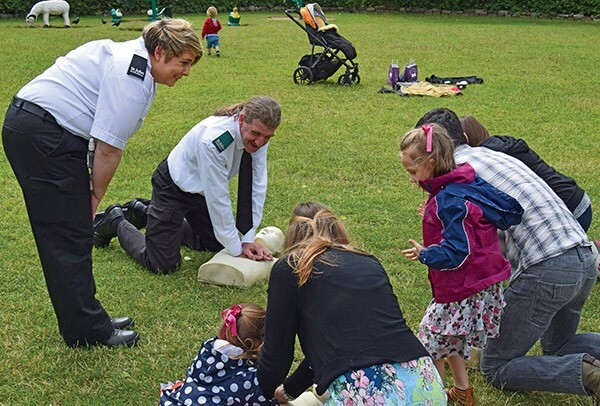 This idea materialised into National CPR day which was on July 18th in places such as the Zoo, Dundrum shopping centre and other nationwide points. “Four minutes” was a statistic Behan kept blasting out. In his line of work he knows how valuable that time is. “If no blood has got to the brain within four minutes the brain begins to die.” He kept repeating it, knowing how vital it is for the affected. Implicit in his mantra is the passion to spread the simple CPR resuscitation technique, because just knowing how to resuscitate until an ambulance arrives can save so many lives and prevent brain damage in those who survive. If most people knew it then there is a likelihood that many thousands of lives could be saved. We don’t know who will be stricken with heart problems or where or when it will happen, but knowing CPR is like caring for your loved one. You could be the lifesaver.